Ok, I was just ranting there... back to where I was. Now I'm not getting that error, so maybe they are listening to me? Maui Kane (Men´s) Black Just Maui´d Slippers are made of the same durable rubber as the women´s slippers. You will make points by matching your "Wahine" when you walk down the beach during your wedding and honeymoon. 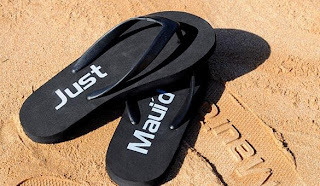 Each Just Maui´d slipper is made with a two piece construction, so you don´t see the tang plug on the bottom, like with most rubber slippers. Sorry to say Blogger, but I think that you have been pretty much replaced by Facebook. It's just that Facebook it a lot of ideas very quickly, while in a blog you can elaborate more on topics. See our latest couples on our Company Facebook page at https://www.facebook.com/pages/Hawaii-Weddings/170175859691 here a a "Trash the dress" photo I did a while back. This couple (who didn't want to be named) wanted to do the "Trash the dress" shots as part of their wedding but didn't tell me until after I was almost done. Here is a tip, if you want the "Trash the dress" shot, you should tell us before your wedding so we have enough time to do it while it's still sunset. Either way though, it came out nicely and they really enjoyed it. Although I wouldn't want to be the guy at the rental car company that has to clean all the sand out of the car afterwards. You should also bring a towel if you are planning stuff like this. I welcome more couples who want to do the "Trash the dress" photos. Just remember to bring a change of clothes if you are going out to dinner afterwards. took of me when I wasn't looking (he is really good at that!) 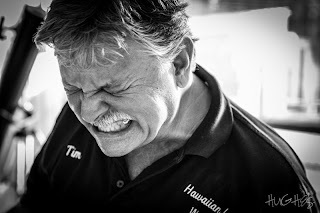 and I though twice about publishing, but there is something to be said for the emotion that he captured here. Scott is really good at photojournalism. I don't know what was going one here... but there is emotion. And yes, I'm okay now. Okay, I know it has been forever since I've posted here, but stuff has been happening so fast that it can't even be written down fast enough. OK, I'm not an expert at blogging, and my blogger friends are the first to tell me that... but I'm doing lots of other things to make the world work on the web. Here are some things that are new since my last posts. An exciting project, as a challenge from a website designer friend of mine, My Website (this one) was a learning experience in deciphering html5, jquery & css3 code and making new websites which are looked favorably by Google and other search engines as scalable across all platforms on the web. As desktop applications are being phased out, and the mobile market is taking over, easy to navagate websites like this will be the norm in the future. Thanks to that designer for pushing me complete this project. Just recently I have been working on rel= author tags for websites that I have contributed to, like all of them generally. Google will include your face in the search results and you will have an "expert" status with this links. Now, I would say that if you have a website, you should really do this, but you don't want to use a "selffy" that you shot in the bathroom, get yourself a professional portrait made or have a pro you know do it for you. Remember, this is your face that will be seen by millions, so take the time to make it a good shot. I hope you like mine. Besides getting more clicks than other results without photos, since all new android phones automatically sign you up with a Google + account, you will probably get more pluses!